The holidays are a stressful time for almost everyone but adding veganism to the mix can make it even harder. You may have crossed some substantial hurdles in your time as a vegan, but nothing compares to big family gatherings when it comes to bringing out the best and worst in people. The good news is, preparing now for the big day can make a huge difference in how well you get through the holiday season. You may not make any converts, but you might convince your mother you’re not starving to death, anyway. Most people aren’t exactly clear about every part of veganism. If you offer to help cook the meal instead of simply giving your host a list of foods you won’t eat, you’ll be opening a dialogue that can end in some great education. You can take some stress off the host by offering to cook veganized versions of holiday favorites, and you can bring vegan ingredients to help make sure the dishes served are ones you want to eat. Bringing a dish you can eat is one way to ensure you have something on your plate, but it’s a holiday! You want to put food on the table that everyone will enjoy. Instead of going all-out and creating something many people will think of as weird (not everyone knows the goodness of quinoa), why not pass a dish that everyone will want the recipe for? Think eggplant parmesan, sweet potato fritters or an indulgent cinnamon apple pie for dessert. You’ll get them any time, but if this is your first year of living vegan, get ready for a ton of questions at the dinner table. Be they smart or be they strange, it’s best to take them with a smile. You don’t have to know the answer to everything, of course, but a little preparation ahead of time couldn’t hurt. Find a couple of documentaries like Forks Over Knives that you can recommend to curious people. Get an answer set in your mind for that inevitable question: Why? If all else fails, gather email addresses and promise to send everyone more information. Did they serve the cheese on the side instead of on the salad? That’s fantastic! Have they stopped eating red meat and now only eat chicken and fish? What a great and healthy step! Not everyone is as far along on this journey as you are. Every little step is important, so cheer them on to encourage more steps in the future. If people want to ask you about recipes and flavors, that’s fantastic. But if the talk starts to turn to moral reasons for veganism, factory farms and other unpleasant topics, just flat-out tell everyone you’d rather not discuss it during such a festive occasion. Instead of yammering on about heart attacks and clogged arteries, they might get the hint and switch to funny jokes. Traditions are tied tightly to our emotions. You’ve probably got very good reasons for becoming a vegan. You don’t want to have anything to do with that Christmas turkey, but it’s likely that you’ll feel sad because you’re not going to eat it. It’s got nothing to do with the food and everything to do with your long history of great family meals. The cure for this is to create a whole new set of holiday traditions. 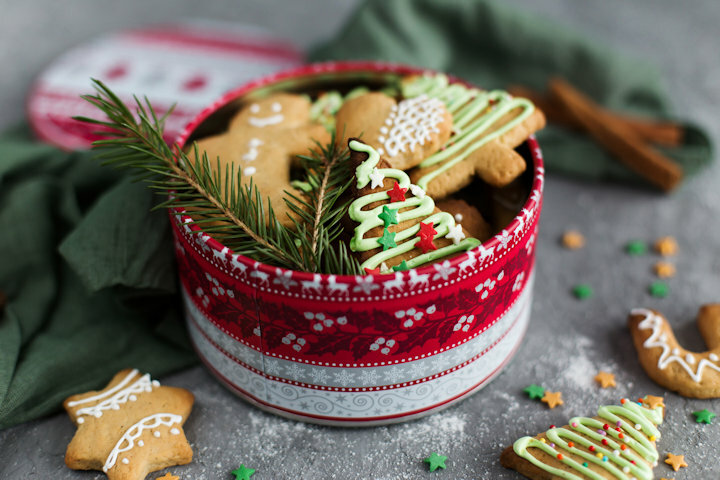 Start a Christmas cookie baking weekend with three or four vegan friends. Encourage international cuisine at family dinners and show how tasty their vegan dishes can be. Start new family traditions that have absolutely nothing to do with food: annual family snowball fight, anyone? Every tradition started with someone deciding to do something two years in a row, and it grew from there. Make your own vegan versions. If you’ve lived through at least one set of holidays as a vegan, what’s your favorite tip for getting through the family gatherings without tension?